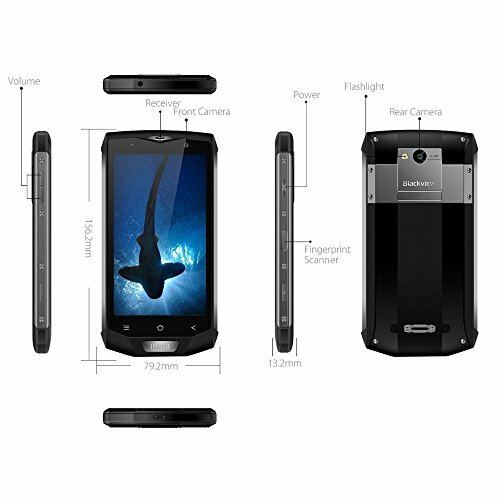 High Performance & Fast Speed:With the latest Andorid 7.0 OS,the operation will be more convenient.Speedy and more stable LTE 4G+ whose upload speed can reach 50Mbps,and download speed is go up to 300Mbps.Equipped with 6GB RAM and 64GB ROM(support 128GB TF Card).Dual nano SIM card,dual standby,one talk.4180mAH high-capacity battery with power-saving to support long time standby and quick charger.this rugged mobile phone applies not only to outdoor enthusiast,but also to businessman. Military IP68 Rating Safeguard: BV8000 Pro can keep water out to a depth of 1m for 30 minutes. What makes it so special is that there is no waterproof glug for usb port and earphone port. Corning gorilla glass 3 makes the device slightly more resilient in the event of a fall too,even survives after dropping from 30m RC drone.Professional serve under whatever kind of extreme hard environments,through rigorous tests of contortion, high and low temperature, and physical key reliability. 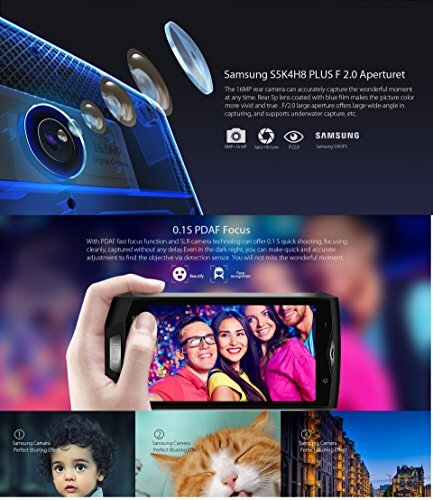 16MP&8MP Sumsung Camera & 0.1S Touch ID:Adopt Sumsung S5K4H8 PLUS F2.0 aperturet, 16-megapixel rear camera will shoot vibrant photos and videos for you even in low light. 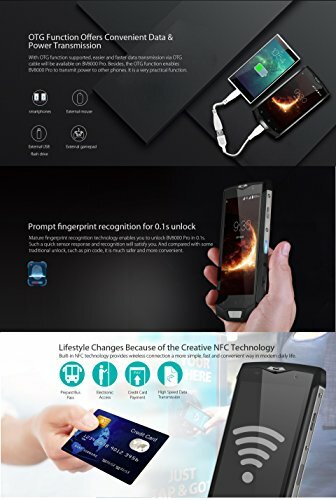 With lateral fingerprint function, you can wake this dual sim phone in 0.1s with your finger slightly touching the scanner, no need to input the boring password again and again at each usage.Dual nano sim cards and 1 TF card which ensures you to balance your personal and business time easily. 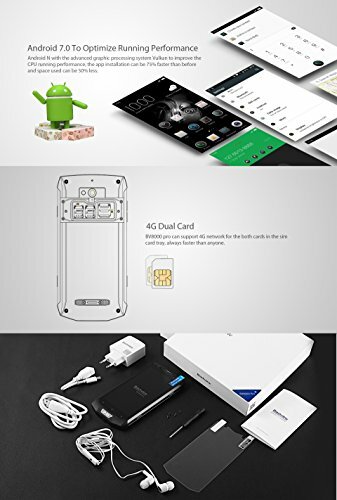 Unlocked 4G LTE Network:Worldwide unlocked with EU power adapter,use in America,Africa,Asia,Europe etc.Compatible with AT&T,T-mobile in US.Support Network:WCDMA,GSM,FDD-LTE,TDD-LTE,2G Bands: GSM 850/900/1800/1900MHz,3G Bands: WCDMA 850/900/1700/1900/2100MHz,4G Bands: FDD:B1/B2/B3/B4/B5/B7/B17/B19/B20,TDD:B38/B39/B40/B41.Please check if your carrier supports the bands for this model before purchasing. 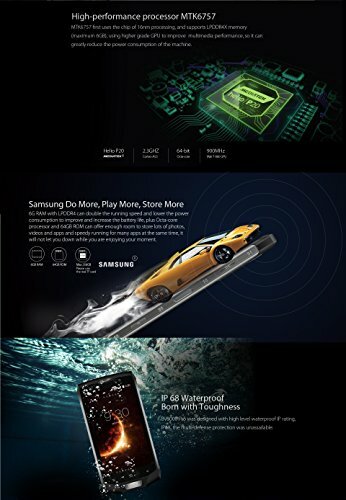 Official Warranty & Features:You will enjoy a 12-Month Warranty and Free Lifetime Technical Support(except man-made damage to the battery, screen, motherboards). 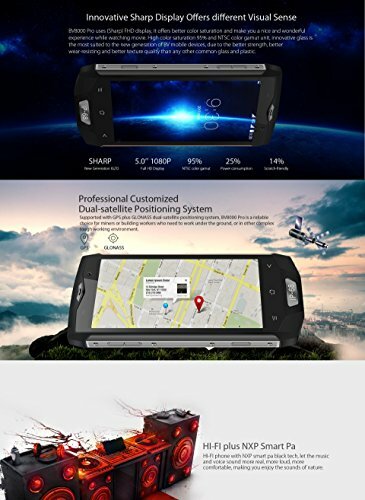 Features: GPS +Glonass dual satellite positioning system, NFC fast payment, OTG transfer, Outdoor Toolbox, Compass, PPT button, SOS function and so on.Proper installation of SIM card is important to successful use so please use the special tools we provided and check the user manual to ensure correct installation.